Karene O’Hare was an incredibly outgoing, compassionate, loving, and kind woman adored by her husband of 55 years, with five grown children and their spouses, and six wonderful grandchildren. She loved anyone she encountered and truly felt that life was a gift to be lived to the fullest each day. 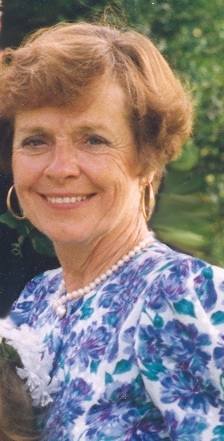 She had a spunky, mischievous, and adventurous side that endeared her to her teenaged grandchildren and their friends. Karene was born in Pittsburg, PA on January 25, 1931 and passed away on October 8 2008. She grew up in Winfield, KS and graduated from the College of St Teresa in KC Missouri with a degree in Nursing. After she and her husband moved to Williamsburg, VA., she quickly joined many organizations including two vocal choirs, a hand bell choir, Church outreach programs, and served on neighborhood Boards of Directors. Her first priority in life was helping those in need. She frequently commented that she felt most passionate about her volunteer nursing work at the Lackey Free Family Medicine Clinic. Karene never met a stranger and found beauty in each encounter whether it was a clerk at the store, someone sitting next to her on an airplane, or her numerous doctors and nurses who were lucky enough to experience her contagious smile and loving, gentle spirit. She had a way of seeing only the good in others. Karene could never say NO to anyone who needed help. She was a devoted friend, always looking at the glass half-full. She fought every day with the courage and determination that she had demonstrated all of her life. She very seldom complained – rather, she worried about all of her caretakers – whether they had eaten recently, had enough sleep, or were missing something important in their lives by being with her. She was truly the most selfless person most people have encountered in their lives. Karene often comforted her family who remained with her day and night at the hospital or at home during her entire illness. Her tiny 85 lb body fought her battle with more courage than those around her had ever witnessed. If she felt ok for an hour or two, she would jump out of bed and make a dessert or meal for those in need. Her greatest joy was when she was able to drive again. She threw a wig or hat on her beautiful bald head, jumped in her car and felt glorious freedom even if it was only for a trip to the grocery store. She was the most incredible role model for those around her. Karene’s spark, love and enthusiasm for life were infectious and she left this earth a far better place for having graced us with her love. She is deeply missed every hour of every day that passes.